Bashar al-Assad rules Syria with the same kind of tyrannical tactics common in Iran under the rule of his mullah partners. That includes the use of chemical weapons to target and kill pockets of resistance to his rule; the most recent strike coming recently and claiming the lives of men, women, and children in grisly scenes broadcast around the world. The repeated use of such weapons resulted in a coordinated strike by the military forces of the U.S., Great Britain and France against three sites identified as having been storage or development sites for Assad’s chemical weapons this past weekend. 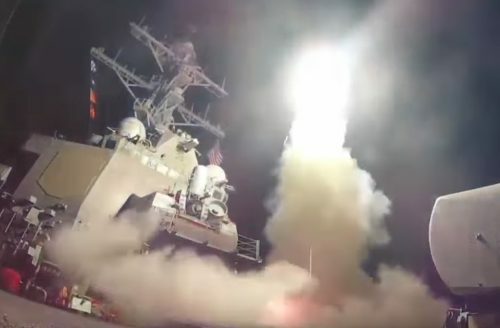 The strikes themselves were hardly a surprise given the level of revulsion around the world to Assad’s continued use of chemical weapons and the tweeting by President Donald Trump of his open intention to punish the rogue regime. What was interesting was his televised address once the attacks began of his putting the Iranian regime and Russia on notice for their continued support of the Assad regime. “What kind of a nation wants to be associated with the mass murder of innocent men, women, and children?” the president said. President Trump asks an important question and really the only one that matters for the future of Syria and the Middle East. Under his predecessor’s administration, the U.S. engaged in a foreign policy based largely on appeasing regional bad actors like the Iranian regime in an effort to coax them to adhere to dubious international agreements. That policy led to agreements that essentially exempted Iran from militant actions that only exacerbated and inflamed regional conflict. Those policies gave us the quagmire President Trump now faces where there are hardly any good choices. The decision to strike militarily was not taken lightly and it says much for the sake of future diplomacy when the U.S. was joined by British and French military forces in a united show of force. Take into consideration the positive alignments by the Arab world led by Saudi Arabia in confronting Iranian regime’s aggression and we see a world moving towards to the kind of unified front that helped bring the Iranian regime to the bargaining table in the first place with crushing economic sanctions before the Obama administration let the regime off the hook. “We renew our strong condemnation of terrorist acts carried out by Iran in the Arab region, and we reject its blatant interference in the internal affairs of Arab countries,” Saudi King Salman said at a summit of Arab leaders, without referencing Friday’s missile strikes on Syria, according to Reuters. Riyadh expressed its support for the strikes on Damascus in a statement on Saturday. But for the Trump administration, the strike was more than just eradicating chemical stockpiles—stockpiles that the Russians had promised were removed under their supervision in a deal with the Obama administration—but rather about a broader agenda that includes containing the Iranian regime. In an interview with ABC News, White House press secretary Sarah Sanders said the U.S. had three objectives in Syria: Defeating ISIS, containing Iran and ending the use of chemical weapons. Which makes the reaction by the Iran lobby, specifically the National Iranian American Council, all the more appalling. We cannot believe Marashi was educated in a home for mentally deficit children growing up, but he must assume the world’s journalists are idiots when he calls for deflecting attacks on Syria because Russian and Iranian forces are deeply embedded there since it was the Iranian regime and Russia that have been supporting Assad and enabling his use of chemical weapons in the first place! Wouldn’t it have been more responsible for Marashi and NIAC to denounce Assad’s use of chemical weapons and urge Iran and Russia to use their influence on Assad to de-escalate the conflict and garner a promise from him not to gas his own people anymore? Instead Marashi ends the paltry statement by calling U.S. action “reckless” but only citing a “duty” by Iran and Russia to rein in Assad. Hardly a denunciation of the use of vile weapons. “A large part of the reason that Syria is in ruins today is because nearly all actors have pursued military solutions instead of diplomacy aimed at halting the bloodshed. An eye for an eye approach will not bring justice or peace to Syria, and there is no moral high ground for those who respond to abhorrent violence with more violence,” Marashi also writes. The irony of Marashi calling out the lack of diplomatic actions when the Iranian regime ignored diplomatic efforts to stop the Syrian civil war when it started and instead poured billions of dollars to prop up Assad, mobilized tens of thousands of Hezbollah fighters from Lebanon, shipped in Iranian-backed Shiite militias from Iraq, recruited Afghan mercenaries and started an airlift of ammunition and supplies using its own regional airlines is appalling to any rational observer. The Iranian regime has been the guilty in ignoring diplomacy and using sheer military might to hold Syria together for Assad. Remember, it was the Iranian regime that sent its notorious Quds Force commander, Qassem Soleimani, on a secret trip to Moscow to beg for Russian intervention in July 2015 to save Assad and Iranian forces from defeat. Marashi’s statement only proves once again how the NIAC and rest of Iran lobby are still working to spread the kind of fake news that helped the Iranian regime avoid crippling sanctions in the first place, freeing the regime to support Assad and allow these chemical attacks to take place in the first place. All of which begs the question: Why does the NIAC support the slaughter of men, women, and children with poison gas?